^ 5.0 5.1 5.2 5.3 5.4 The Kurdish Diaspora. Institut Kurde De Paris. [23 October 2011]. ^ 6.0 6.1 6.2 6.3 6.4 6.5 6.6 6.7 The cultural situation of the Kurds, A report by Lord Russell-Johnston, Council of Europe, July 2006 . ^ 9.0 9.1 9.2 Kreyenbroek, Philip G.; Sperl, Stefan (1992). The Kurds: A Contemporary Overview. London; New York: Routledge. pp. 17–19. ISBN 978-0-415-07265-6. OCLC 24247652. ^ 10.0 10.1 10.2 10.3 10.4 Kreyenbroek, Philip G.; Sperl, Stefan (1992). The Kurds: A Contemporary Overview. London; New York: Routledge. pp. 138–141. ISBN 978-0-415-07265-6. OCLC 24247652. ^ 11.0 11.1 Entessar, Nader (2010). Kurdish Politics in the Middle East. Lanham: Lexington Books. p. 17. ISBN 978-0-7391-4039-0. OCLC 430736528. ^ Ashraf, Ahmad (15 December 2006). "Iranian Identity iv. 19th-20th Centuries". Encyclopædia Iranica. New York: Columbia University. Retrieved 17 August 2013. ^ 14.0 14.1 Izady, Mehrdad (1992). The Kurds: A Concise Handbook. Washington: Crane Russak. p. 198. ISBN 978-0-8448-1729-3. OCLC 25409394. ^ Romano, David (2006). The Kurdish Nationalist Movement: Opportunity, Mobilization and Identity. Cambridge Middle East studies, 22. Cambridge, UK; New York: Cambridge University Press. p. 240. ISBN 978-0-521-85041-4. OCLC 61425259. ^ 23.0 23.1 Katzman, Kenneth (2009). Iraq: Post-Saddam Governance and Security. New York: Nova Science Publishers. p. 32. ISBN 978-1-61470-116-3. OCLC 756496931. ^ Elling, Rasmus Christian (2013). Minorities in Iran: Nationalism and Ethnicity after Khomeini. New York: Palgrave Macmillan. p. 312. ISBN 978-0-230-11584-2. OCLC 714725127. ^ 25.0 25.1 Howard, Roger (2004). Iran in Crisis? : The Future of the Revolutionary Regime and the US Response. London; New York: Zed Books. pp. 185–186. ISBN 978-1-84277-474-8. OCLC 54966573. ^ World Gazetteer. Gazetteer.de. [2011-12-02]. ^ Syria: End persecution of human rights defenders and human rights activists 互联网档案馆的存檔，存档日期2007-10-13..
^ Syria: The Silenced Kurds. Hrw.org. [2011-12-02]. ^ Washington, D.C. Syria's Kurds Struggle for Rights. Voanews.com. 2005-09-02 [2011-12-02]. ^ Vinsinfo. The Media Line. The Media Line. [2011-12-02]. （原始内容存档于2011-09-30）. ^ Syria to tackle Kurd citizenship problem - Just In (Australian Broadcasting Corporation). Abc.net.au. 2011-04-01 [2011-12-02]. 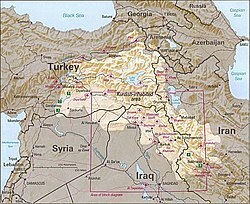 ^ Syria: Address Grievances Underlying Kurdish Unrest. Hrw.org. 2004-03-18 [2011-12-02]. ^ Serhildana 12ê Adarê ya Kurdistana Suriyê[永久失效連結]. ^ 新頭殼newtalk. 拉攏庫德族 敍利亞：打敗IS就來談自治. Yahoo奇摩新聞. 2017-09-27 [2017-09-27] （中文（台灣）‎）.